When a substance or process falsely alters the test results, it may lead to inappropriate further tests, incorrect diagnosis and treatments with potentially unfavourable outcomes for the patient. 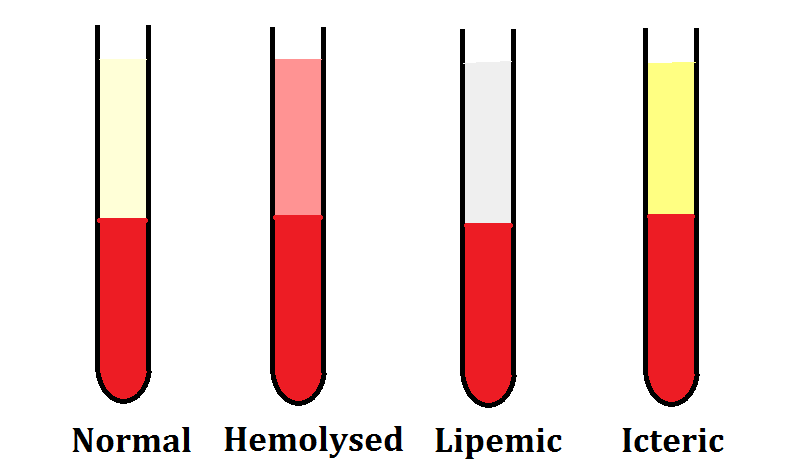 Interferences from hemolysis, lipemia and icterus are most frequently noted which alter the assay results. Hemolysis is the most common reason for sample rejaction by laboratories. Hemolysis is defined as the rupture of red blood cells with the release of hemoglobin and the intracellular components into the plasma. The release of hemoglobin causes the serum or plasma to appear pale red to cherry red in color. Hemolysis may be intravascular or extravascular. Intravascular hemolysis is very rare and is usually the result of blood transfusion reaction or hemolytic anemia. Extravascular hemolysis is quite common and occurs during improper phlebotomy techniques, handelling, transport and storage of specimens. Leakage of constituents of red blood cells into plasma or serum. Participation of the hemoglobin in the reaction through augmentation or inhibition. Dilution of serum or plasma components. Lipemia is the presence of excess lipids or fats in the bloodstream. This phenomenon causes the plasma or serum to appear turbid or ‘milky’. Lipemia is the increased concentration of triglyceride-rich lipoproteins in blood resulting in the cloudy/turbid appearance of serum or plasma. As lipoproteins vary in sizes, not all contribute equally to turbidity. The largest particles, chylomicrons have the greatest potential in causing turbidity of the sample. Light scattering effects may increase absorbances during end point reactions and non-blanked reactions for some analytes. Volume displacement effect greatly decreases the value of some analytes particularly electrolytes; Na+,K+. Hemolysis of RBCs is enhanced in the presence of lipemia. Non homogeneity of the sample. Icterus or hyperbilirubenemia is the presence of high levels of bilirubin. Icteric serum or plasma ranges in color from dark to bright yellow, rather than normal straw color. Icterus occurs because of the increased bilirubin production or inappropriate excretion. eg: hemolytic anemia, liver diseases, biliary tract obstruction etc. Ability to react chemicals in other reagents resulting in decreased analyte values. Spectral interferences during color measurement. Nice and useful tips, we have studied but…. thank you for your nice updates on hemolysis,i will always use this tool in my lab. work in clinical chemistry examinations to ensure accuracy of results and effective treatment by the physicians for their patients. i was clarified because of your knowledge about hemolysis,thank you. if i want to process lipemic sample in semi autoanlyzer than what procedure i will take to improve sample and true report. Thanks for nice update ,the effect of lipemic, heamolysis, and icteric different ( decrease or increase) are significant I mean there is any accepted range of different . how we correct the interference? Dear Dhurba! Many thanks for your updates, it was very useful but could you give us the source for all of post in next time? Thank you. IS THAT CORRECT CALCIUM LEVEL INCREASE IN HEMOLYSED SAMPLES?? If the Lipaemic, Icteric and Haemolysis are absent is that good.